3 Tap / leavers, 2 flavours counter top or standing unit. Option between soft serve ice cream or soft serve frozen yoghurt. 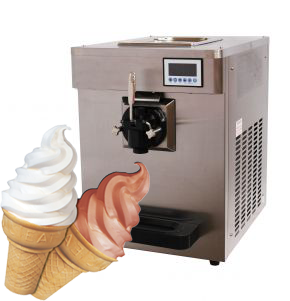 Soft serve ice cream or frozen yoghurt machine: I scream! You scream! We all scream for ICE CREAM! Everybody loves ice cream, especially soft serve ice cream. And now you can also go for delicious frozen yoghurt! 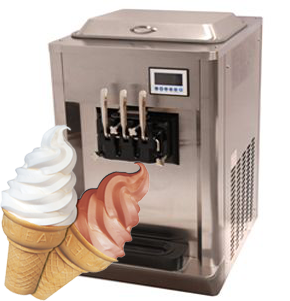 Rental packages including ice cream or frozen yoghurt with cones or cups. Treat your guests with soft serve ice cream or frozen yoghurt for desert!!! Frozen yogurt flavors: Raspberry, Strawberry, cherry, banana, english toffe, caramel, fruits of the forrest, cheesecake, blueberry, grape, passion fruit, litchi, pineapple, cream soda, plain etc. Ice cream flavors: Vanilla, strawberry, raspberry, cream soda, bubble gum and chocolate. There is also a variety of extras: Flakes, sprinkles, syrups etc.